Does anyone have any of these lying around? Specifically, im after any of the American Laser Games shooters. I have three laser disc players (industrial type with RS232) and two arcade board sets (Astron Belt and Dragon's Lair II). Sounds great mate yeah, i have the Daphne Singe edition emulator for all the American Laser games shooters, but they use the Digital Leisure PC CDROM versions of the games to get the video footage, which is fine, but the video quality is still down on the original arcade laser disc versions, and in a couple cases there are missing scenes. Most noticable is in Crime Patrol 2 Drug Wars, there is one whole section missing from one stage, so its like youre starting from the middle of that assignment. I really enjoy Drug Wars and Mad Dog 2, those are great shooting games! I didnt know it had two discs for the game though, thought it was only one, maybe its just two copies of the same disc? Neat project. I'd like to see where you guys end up with this. A reasonable facsimile to be sure. What display will you use? Probably a 29" CRT, if i dont convert my 9PG into a 51" rear projection TV shell. What i really need is the Act Labs light guns and the VGA boxes for them, i can get the guns no problem but i need those VGA boxes and those are hard to find. These are using Daphne Singe to play, they use the remastered CD ROM versions to get the video clips. I have a couple of the DVD versions coming, im going to try converting the video files from those discs to m2v files and replace them into the directories, ive done a heap of reading and it should be possible. No, just looked it up when you mentioned it. 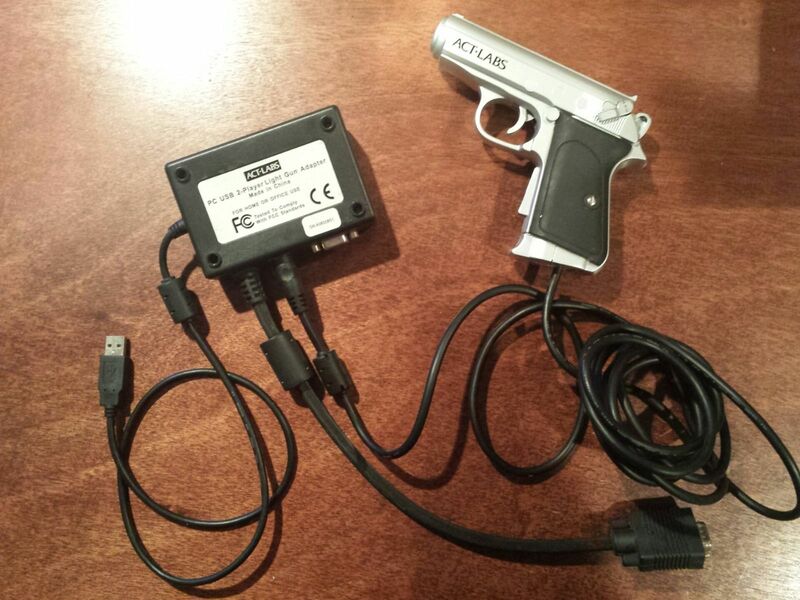 Theyre no longer available, you can still buy the red version of the gun, but its useless without that VGA box, which ( so it seems ) is very sort after, hasnt been made in years, and has run out a fair while back. There isnt really an easier way. Until you found that one for me i had not seen a single one for sale anywhere at all. Those are the only true CRT needing light guns that work as the older guns did, and that method makes for exceptional accuracy compared to the newer style that uses the IR bars with LEDs in it. Basically with the CRT style guns, you calibrate once, and from there you can stand anywhere in the room and what you point at is what you hit. The LED style needs to be calibrated from where youre playing, hand it to the person beside you or your very tall friend, its almost useless. Ahhh I see; supply and demand. I tried one of the LED bar games. WORST than useless. No where near accurate. I'll keep my eyes peeled for more of these. I'm surprised they're still so sought after. I would think everybody would be going to LCD/LED displays and ditching their old CRT toys.